For other uses, including the Roman god, see Mars (disambiguation). Mars (IPA: /ˈmɑɹz/, BrE IPA: /ˈmɑːz/) is the fourth planet from the Sun in the Solar System. The planet is named after Mars, the Roman god of war. It is also referred to as the "Red Planet" because of its reddish appearance as seen from Earth. A terrestrial planet, Mars has a thin atmosphere and surface features reminiscent both of the impact craters of the Moon and the volcanoes, valleys, deserts and polar ice caps of Earth. It is the site of Olympus Mons, the highest known mountain in the solar system, and of Valles Marineris, the largest canyon. In addition to its geographical features, Mars’ rotational period and seasonal cycles are likewise similar to those of the Earth. Until the first flyby of Mars by Mariner 4 in 1965, it was speculated that there might be liquid water on the planet. This was based on observations of periodic variations in light and dark patches, particularly in the polar latitudes, which looked like seas and continents, while long, dark striations were interpreted by some observers as irrigation channels for liquid water. These straight line features were later proven not to exist and were instead explained as optical illusions. Still, of all the planets in our solar system, Mars is the most likely, other than Earth, to harbor liquid water, and perhaps life. Mars is currently host to three functional orbiting spacecraft: Mars Odyssey, Mars Express, and Mars Reconnaissance Orbiter. This is more than any planet except Earth. The surface is also home to the two Mars Exploration Rovers (Spirit and Opportunity). Geological evidence gathered by these and preceding missions suggests that Mars previously had large-scale water coverage, while observations also indicate that small geyser-like water flows have occurred in recent years. Observations by NASA's Mars Global Surveyor show evidence that parts of the southern polar ice cap have been receding. Mars has two moons, Phobos and Deimos, which are small and irregularly shaped. These may be captured asteroids, similar to 5261 Eureka, a Martian Trojan asteroid. Mars can be seen from Earth with the naked eye. Its apparent magnitude reaches −2.9, a brightness surpassed only by Venus, the Moon, and the Sun, though for much of the year Jupiter may appear brighter to the naked eye than Mars. Mars has half the radius of Earth and only one-tenth the mass, being less dense, but its surface area is only slightly less than the total area of Earth's dry land. While Mars is larger and more massive than Mercury, Mercury has a higher density. This results in a slightly stronger gravitational force at Mercury's surface. The red-orange appearance of the Martian surface is caused by iron(III) oxide, more commonly known as hematite, or rust. 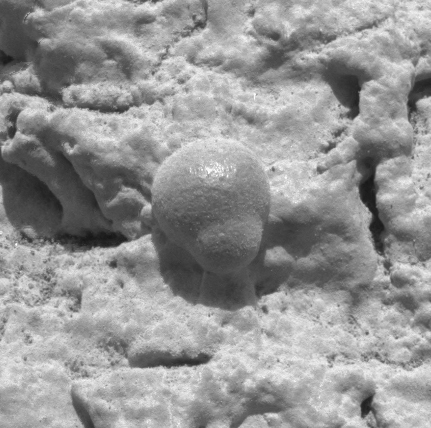 Based on orbital observations and the examination of the Martian meteorite collection, the surface of Mars appears to be composed primarily of basalt. Some evidence suggests that a portion of the Martian surface is more silica-rich than typical basalt, and may be similar to andesitic stones on Earth; however, these observations may also be explained by silica glass. Much of the surface is deeply covered by a fine iron(III) oxide dust that has the consistency of talcum powder. Although Mars has no intrinsic magnetic field, observations show that parts of the planet's crust have been magnetized and that alternating polarity reversals of its dipole field have occurred. This paleomagnetism of magnetically-susceptible minerals has properties that are very similar to the alternating bands found on the ocean floors of Earth. One theory, published in 1999 and re-examined in October 2005 (with the help of the Mars Global Surveyor), is that these bands demonstrate plate tectonics on Mars 4 billion years ago, before the planetary dynamo ceased to function (and, thus, the magnetic field). Current models of the planet's interior imply a core region approximately 1,480 kilometres (920 mi) in radius, consisting primarily of iron with about 15–17% sulfur. This iron sulfide core is partially fluid, and has twice the concentration of the lighter elements than exist at Earth's core. The core is surrounded by a silicate mantle that formed many of the tectonic and volcanic features on the planet, but now appears to be inactive. The average thickness of the planet's crust is about 50 km (31 mi), with a maximum thickness of 125 km (78 mi). Earth's crust, averaging 40 km (25 mi), is only a third as thick as Mars’ crust relative to the sizes of the two planets. Liquid water cannot exist on the surface of Mars with its present low atmospheric pressure, but water ice is in no short supply, with two polar ice caps made largely of ice. In March 2007, NASA announced that the volume of water ice in the south polar ice cap, if melted, would be sufficient to cover the entire planetary surface to a depth of 11 metres (36 ft). Additionally, an ice permafrost mantle stretches down from the pole to latitudes of about 60°. Much larger quantities of water are thought to be trapped underneath Mars' thick cryosphere, only to be released when the crust is cracked through volcanic action. The largest such release of liquid water is thought to have occurred when the Valles Marineris formed early in Mars' history, enough water being released to form river valleys across the planet. A smaller but more recent event of the same kind occurred when the Cerberus Fossae chasm opened about 5 million years ago, leaving a sea of frozen ice still visible today on the Elysium Planitia. More recently the high resolution Mars Orbiter Camera on the Mars Global Surveyor has taken pictures which give much more detail about the history of liquid water on the surface Mars. Despite the many giant flood channels and associated tree-like network of tributaries found on Mars there are no smaller scale structures that would indicate the origin of the flood waters. It has been suggested that weathering processes have denuded these, indicating the river valleys are old features. Higher resolution observations from spacecraft like Mars Global Surveyor also revealed at least a few hundred features along crater and canyon walls that appear similar to terrestrial seepage gullies. The gullies tend to be located in the highlands of the southern hemisphere and to face the Equator; all are poleward of 30° latitude. The researchers found no partially degraded (i.e., weathered) gullies and no superimposed impact craters, indicating that these are very young features. Since Mars has no oceans and hence no 'sea level', a zero-elevation surface or mean gravity surface also had to be selected. Zero altitude is defined by the height at which there is 610.5 Pa (6.105 mbar) of atmospheric pressure. This pressure corresponds to the triple point of water, and is approximately 0.6% of the sea level surface pressure on Earth. The shield volcano, Olympus Mons (Mount Olympus), at 26 km is the highest known mountain in the solar system. It is an extinct volcano in the vast upland region Tharsis, which contains several other large volcanoes. It is over three times the height of Mt. Everest which in comparison stands at only 8.848 km. Mars is also scarred by a number of impact craters: a total of 43,000 craters with a diameter of 5 km or greater have been found. The largest of these is the Hellas impact basin, a light albedo feature clearly visible from Earth. Due to the smaller mass of Mars, the probability of an object colliding with the planet is about half that of the Earth. However, Mars is located closer to the asteroid belt, so it has an increased chance of being struck by materials from that source. Mars is also more likely to be struck by short-period comets, i.e., those that lie within the orbit of Jupiter. In spite of this, there are far fewer craters on Mars compared with the Moon because Mars' atmosphere provides protection against small meteors. Some craters have a morphology that suggests the ground was wet when the meteor impacted. Images from the Thermal Emission Imaging System (THEMIS) aboard NASA's Mars Odyssey orbiter have revealed seven possible cave entrances on the flanks of the Arsia Mons volcano. The caves, named Dena, Chloe, Wendy, Annie, Abbey, Nikki and Jeanne after loved ones of their discoverers, are collectively known as the "seven sisters." Cave entrances measure from 100 m to 252 m wide and they are believed to be at least 73 m to 96 m deep. Because light does not reach the floor of most of the caves, it is likely that they extend much deeper than these lower estimates and widen below the surface. Dena is the only exception, its floor is visible and was measured to be 130 m deep. The interiors of these caverns may be protected from micrometeoroids, UV radiation, solar flares and high energy particles that bombard the planet's surface. Some researchers have suggested that this protection makes the caves good candidates for future efforts to find liquid water and signs of life. Mars' thin atmosphere, visible on the horizon in this low orbit photo. Mars lost its magnetosphere 4 billion years ago, so the solar wind interacts directly with the Martian ionosphere, keeping the atmosphere thinner than it would otherwise be by stripping away atoms from the outer layer. Both Mars Global Surveyor and Mars Express have detected these ionised atmospheric particles trailing off into space behind Mars. As such the atmosphere of Mars is relatively thin; atmospheric pressure on the surface varies from around 30 Pa (0.03 kPa) on Olympus Mons to over 1155 Pa (1.155 kPa) in the depths of Hellas Planitia, with a mean surface level pressure of 600 Pa (0.6 kPa). This is less than 1% of the surface pressure on Earth (101.3 kPa). The equivalent pressure of Mars' atmosphere can be found at a height of 35 km above the Earth's surface. The scale height of the atmosphere is about 11 km; higher than Earth's 6 km due to the lower gravity. The atmosphere on Mars consists of 95% carbon dioxide, 3% nitrogen, 1.6% argon, and contains traces of oxygen and water. The atmosphere is quite dusty, containing dust particulates of about 1.5 µm across which give the Martian sky a tawny color when seen from the surface. Several researchers claim to have detected methane in the Martian atmosphere with a concentration of about 10 ppb by volume. Since methane is an unstable gas that is broken down by ultraviolet radiation, typically lasting in the atmosphere for about 340 years, its presence on Mars could indicate that there is (or has been within the last few hundred years) a source of the gas on the planet. Volcanic activity, comet impacts, and the existence of life in the form of microorganisms such as methanogens are among possible sources. It was recently shown that methane could also be produced by a non-biological process involving water, carbon dioxide, and the mineral olivine, which is known to be common on Mars. For its winter, each pole lies in continuous darkness, while the surface gets so cold that as much as 25–30% of the atmosphere condenses out into thick slabs of CO2 ice (dry ice). When the poles are again exposed to sunlight, the CO2 ice sublimes, creating enormous winds that sweep off the poles as fast as 400 km/h (250 mph). These seasonal actions transport large amounts of dust and water vapor, giving rise to Earth-like frost and large cirrus clouds. Clouds of water-ice were photographed by the Opportunity rover in 2004. Of all the planets, Mars' seasons are the most Earth-like, due to the similar tilts of the two planets' rotational axes. However, the lengths of the Martian seasons are about twice those of Earth's, as Mars’ greater distance from the sun leads to the Martian year being approximately two Earth years in length. Martian surface temperatures vary from lows of approximately −140 °C (−220 °F) during the polar winters to highs of up to 20 °C (70 °F) in summers. The wide range in temperatures is due to the thin atmosphere which cannot store much solar heat, the low atmospheric pressure, and the low thermal inertia of Martian soil. If Mars had an Earth-like orbit, its seasons would be similar to Earth's because its axial tilt is similar to Earth's. However, the comparatively large eccentricity of the Martian orbit has a significant effect. Mars is near perihelion when it is summer in the southern hemisphere and winter in the north, and near aphelion when it is winter in the southern hemisphere and summer in the north. As a result, the seasons in the southern hemisphere are more extreme and the seasons in the northern are milder than would otherwise be the case. The summer temperatures in the south can be up to 30 K warmer than the equivalent summer temperatures in the north. Mars also has the largest dust storms in the Solar System. These can vary from a storm over a small area, to gigantic storms that cover the entire planet. They tend to occur when Mars is closest to the Sun, and have been shown to increase the global temperature. The polar caps at both poles consist primarily of water ice. However, there is dry ice present on their surfaces. Frozen carbon dioxide (dry ice) accumulates as a thin layer about one metre thick on the north cap in the northern winter only, while the south cap has a permanent dry ice cover about eight metres thick. The northern polar cap has a diameter of approximately 1,000 kilometres during the northern Mars summer, and contains about 1.6 million cubic kilometres of ice, which if spread evenly on the cap would be 2 kilometres thick. (This compares to a volume of 2.85 million cubic kilometres for the Greenland ice sheet.) The southern polar cap has a diameter of 350 km and a thickness of 3 km. The total volume of ice in the south polar cap plus the adjacent layered deposits has also been estimated at 1.6 million cubic kilometres. Both polar caps show spiral troughs, which are believed to form as a result of differential solar heating, coupled with the sublimation of ice and condensation of water vapor. Both polar caps shrink and regrow following the temperature fluctuation of the Martian seasons. Mars has a relatively pronounced orbital eccentricity of about 9%; of the other planets in the solar system, only Mercury shows greater eccentricity. However, it is known that in the past Mars has had a much more circular orbit than it does currently. At one point 1.35 million Earth years ago, Mars had an eccentricity of only 0.2%, much less than that of Venus or Neptune today. Although Mars takes twice as long as the Earth to orbit the Sun, its main cycle of eccentricity variation is slightly shorter than Earth's, with cycles taking 95,000 Earth years. However, there is a much longer cycle of eccentricity with a period of several million Earth years, and this overshadows the 95,000 year cycle in the eccentricity graph of the past three million years. Presently, Mars is approaching an eccentricity maximum, which will be reached in a thousand years. Mars' axial tilt is 25.19 degrees, which is similar to the axial tilt of the Earth. As a result, Mars has seasons like the Earth, though on Mars they are about twice as long given its longer year. Mars passed its aphelion in June 2006 and is now passing its perihelion since June 2007. From the surface of Mars, the motions of Phobos and Deimos appear very different from that of our own moon. Phobos rises in the west, sets in the east, and rises again in just 11 hours. Deimos, being only just outside synchronous orbit—where the orbital period would match the planet's period of rotation—rises as expected in the east but very slowly. Despite the 30 hour orbit of Deimos, it takes 2.7 days to set in the west as it slowly falls behind the rotation of Mars, then just as long again to rise. It is not well understood how or when Mars came to capture its two moons. Both have circular orbits, very near the equator, which is very unusual in itself for captured objects. Phobos's unstable orbit would seem to point towards a relatively recent capture. There is no known mechanism for an airless Mars to capture a lone asteroid, so it is likely that a third body was involved—however, asteroids as large as Phobos and Deimos are rare, and binaries rarer still, outside of the asteroid belt. The current understanding of planetary habitability—the ability of a world to develop and sustain life—favors planets that have liquid water on their surface. This requires that the orbit of a planet lie within a habitable zone, which for the Sun is currently occupied by Earth. Mars orbits half an astronomical unit beyond this zone and this, along with the planet's thin atmosphere, causes water to freeze on its surface. The past flow of liquid water, however, demonstrates the planet's potential for habitability. The lack of a magnetosphere and extremely thin atmosphere of Mars are a greater challenge: the planet has little heat transfer across its surface, poor insulation against bombardment and the solar wind, and insufficient atmospheric pressure to retain water in a liquid form. (Water instead sublimates to a gaseous state.) Mars is also nearly, or perhaps totally, geologically dead; the end of volcanic activity has stopped the recycling of chemicals and minerals between the surface and interior of the planet. Evidence suggests that the planet was once significantly more habitable than it is today, but whether living organisms ever existed there is still unclear. The Viking probes of the mid-1970s carried experiments designed to detect microorganisms in Martian soil at their respective landing sites, and had some apparently positive results, including a temporary increase of CO2 production on exposure to water and nutrients. However this sign of life was later disputed by many scientists, resulting in a continuing debate, with NASA scientist Gilbert Levin asserting that Viking may have found life. A re-analysis of the now 30-year-old Viking data, in light of modern knowledge of extremophile forms of life, has suggested that the Viking tests were also not sophisticated enough to detect these forms of life. The tests may even have killed a (hypothetical) life form. At the Johnson space center lab organic compounds have been found in the meteorite ALH84001, which is supposed to have come from Mars. They concluded that these were deposited by primitive life forms extant on Mars before the meteorite was blasted into space by a meteor strike and sent on a 15 million-year voyage to Earth. Also, small quantities of methane and formaldehyde recently detected by Mars orbiters are both claimed to be hints for life, as these particles would quickly break down in the Martian atmosphere. It is possible that these compounds may be replenished by volcanic or geological means such as serpentinization. Roughly two-thirds of all spacecraft destined for Mars have failed in one manner or another before completing or even beginning their missions. While this high failure rate can be ascribed to technical problems, enough have either failed or lost communications for causes unknown for some to search for other explanations. Examples include an Earth-Mars "Bermuda Triangle", a Mars Curse, or even the long-standing NASA in-joke, the "Great Galactic Ghoul" that feeds on Martian spacecraft. The first successful fly-by mission to Mars was NASA's Mariner 4, launched in 1964. The first successful objects to land on the surface were two Soviet probes, Mars 2 and Mars 3 from the Mars probe program, launched in 1971, but both lost contact within seconds of landing. Then came the 1975 NASA launches of the Viking program, which consisted of two orbiters, each having a lander; both landers successfully touched down in 1976 and remained operational for 6 and 3 years, for Viking 1 and Viking 2 respectively. The Viking landers relayed the first color pictures of Mars and also mapped the surface of Mars so well that the images are still sometimes used to this day. The Soviet probes Phobos 1 and 2 were sent to Mars in 1988 to study Mars and its two moons, unfortunately Phobos 1 lost contact on the way to Mars, and Phobos 2, while successfully photographing Mars and Phobos, failed just before it was set to release two landers on Phobos's surface. Following the 1992 failure of the Mars Observer orbiter, NASA launched the Mars Global Surveyor in 1996. This mission was a complete success, having finished its primary mapping mission in early 2001. Contact was lost with the probe in November 2006 during its third extended program, spending exactly 10 operational years in space. Only a month after the launch of the Surveyor, NASA launched the Mars Pathfinder, carrying a robotic exploration vehicle, which landed in the Ares Vallis on Mars. This mission was another big success, and received much publicity, partially due to the many spectacular images that were sent back to Earth. In 2001 NASA launched the successful Mars Odyssey orbiter, which is still in orbit as of June 2007. Odyssey's Gamma Ray Spectrometer detected significant amounts of hydrogen in the upper metre or so of Mars' regolith. This hydrogen is thought to be contained in large deposits of water ice. Mars Phoenix Lander practices robotic arm control at a test site in Death Valley. The next scheduled mission to Mars, not counting the brief flyby by the Dawn spacecraft to Ceres and Vesta, is the NASA Phoenix Mars lander, expected to launch in 2007 and set to arrive in the north polar region of Mars in 2008. The lander will have a robotic arm with a 2.5 m reach and capable of digging a meter into the Martian soil. The lander will be in an area with an 80% chance of ice being less than 30 cm below the surface, and has a microscopic camera capable of resolving to one-thousandth the width of a human hair. Phoenix will be followed by the Mars Science Laboratory in 2009, a bigger, faster (90 m/hour), and smarter version of the Mars Exploration Rovers. Experiments include a laser chemical sample that can deduce the make-up of rocks at a distance of 13 m.
The joint Russian and Chinese Phobos-Grunt sample-return mission, to return samples of Mars' moon Phobos, is scheduled for a 2009 launch. In 2012 the ESA plans to launch its first Rover to Mars, the ExoMars rover will be capable of drilling 2 m into the soil in search of organic molecules. Manned Mars exploration by the United States has been explicitly identified as a long-term goal in the Vision for Space Exploration announced in 2004 by US President George W. Bush. NASA and Lockheed Martin have begun work on the Orion Crew Exploration Vehicle (CEV), which is currently scheduled to send a human expedition to Earth's moon by 2020 as a stepping stone to an expedition to Mars thereafter. To the naked-eye, Mars usually appears a distinct yellow, orange, or reddish color, and varies in brightness more than any other planet as seen from Earth over the course of its orbit. When farthest away from the Earth, it is more than seven times as far from the latter as when it is closest (when least favourably positioned, it can be lost in the Sun's glare for months at a time). At its most favourable times—which occur twice every 32 years, alternately at 15 and 17-year intervals, and always between late July and late September—Mars shows a wealth of surface detail to a telescope. Especially noticeable, even at low magnification, are the polar ice caps. The point of Mars’ closest approach to the Earth is known as opposition. The length of time between successive oppositions, or the Synodic period, is 780 days. Because of the eccentricities of the orbits, the times of opposition and minimum distance can differ by up to 8.5 days. The minimum distance varies between about 55 and 100 million km due to the planets' elliptical orbits. The next Mars opposition will occur on December 24, 2007. On August 27, 2003, at 9:51:13 UT, Mars made its closest approach to Earth in nearly 60,000 years: 55,758,006 km (approximately 35 million miles). This occurred when Mars was one day from opposition and about three days from its perihelion, making Mars particularly easy to see from Earth. The last time it came so close is estimated to have been on September 12, 57,617 BC., the next time being in 2287. However, this record approach was only very slightly closer than other recent close approaches. For instance, the minimum distance on August 22, 1924 was 0.37284 AU, compared to 0.37271 AU on August 27, 2003, and the minimum distance on August 24, 2208 will be 0.37278 AU. The orbital changes of Earth and Mars are making the approaches nearer: the 2003 record will be bettered 22 times by the year 4000. As Mars approaches opposition it begins a period of retrograde motion, which means it will appear to moved backwards in a looping motion with respect to the background stars. The next retrograde period will begin on November 16, 2007 and last through to January 31, 2008 with Mars appearing to move backwards through the sky from the constellation Gemini into Taurus. The history of observations of Mars is marked by the oppositions of Mars, when the planet is closest to Earth and hence is most easily visible, which occur every couple of years. Even more notable are the perihelic oppositions of Mars which occur approximately every 15–17 years, and are distinguished because Mars is close to perihelion, making it even closer to Earth. Aristotle was among the first known writers to describe observations of Mars, noting that, as it passed behind the moon, it was farther away than was originally believed. In 1609, Mars was viewed by Galileo, who was first to see it via telescope. By the 19th century, the resolution of telescopes reached a level sufficient for surface features to be identified. In September 1877, a perihelic opposition of Mars occurred on September 5. In that year, Italian astronomer Giovanni Schiaparelli, then in Milan, used a 22 cm telescope to help produce the first detailed map of Mars. These maps notably contained features he called canali, which were later shown to be an optical illusion. These canali were supposedly long straight lines on the surface of Mars to which he gave names of famous rivers on Earth. His term was popularly mistranslated as canals. Influenced by the observations the orientalist Percival Lowell founded an observatory which had a 12 and 18 inch telescope. The observatory was used for the exploration of Mars during the last good opportunity in 1894 and the following less favorable oppositions. He published several books on Mars and life on the planet, which had a great influence on the public. The canali were also found by other astronomers, like Perrotin and Thollon in Nice, using one of the largest telescopes of that time. 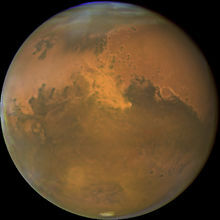 The seasonal changes (consisting of the diminishing of the polar caps and the dark areas formed during Martian summer) in combination with the canals lead to speculation about life on Mars, and it was a long held belief that Mars contained vast seas and vegetation. The telescope never reached the resolution required to give proof to any speculations. However, as bigger telescopes were used, fewer long, straight canali were observed. During an observation in 1909 by Flammarion with a 33 inch telescope, irregular patterns were observed, but no canali were seen. Mars is named after the Roman god of war. In Babylonian astronomy, the planet was named after Nergal, their deity of fire, war, and destruction, most likely due to the planet's reddish appearance. When the Greeks equated Nergal with their god of war, Ares, they named the planet Ἄρεως ἀστἡρ (Areos aster), or "star of Ares". Then, following the identification of Ares and Mars, it was translated into Latin as stella Martis, or "star of Mars", or simply Mars. The Greeks also called the planet Πυρόεις Pyroeis meaning "fiery". In Hindu mythology, Mars is known as Mangala (मंगल). The planet is also called Angaraka in Sanskrit, after the celibate god of war, who possesses the signs of Aries and Scorpio, and teaches the occult sciences. The planet was known by the Egyptians as "Ḥr Dšr";;;; or "Horus the Red". The Hebrews named it Ma'adim (מאדים)—"the one who blushes"; this is where one of the largest canyons on Mars, the Ma'adim Vallis, gets its name. It is known as al-Mirrikh in both Arabic and Persian, and Merih in Turkish. The etymology of al-Mirrikh is unknown. Ancient Persians named it Bahram, the Zoroastrian god of faith. Ancient Turks called it Sakit. The Chinese, Japanese, Korean and Vietnamese cultures refer to the planet as 火星, or the fire star, a name based on the ancient Chinese mythological cycle of Five elements. The popular idea that Mars was populated by intelligent Martians exploded in the late 19th century. Schiaparelli's "canali" observation's combined with Percival Lowell's books on the subject put forward the standard notion of a planet that was a drying, cooling, dying world with ancient civilizations constructing irrigation works. The depiction of Mars in fiction has been stimulated by its dramatic red color and by early scientific speculations that its surface conditions not only might support life, but intelligent life. Also influential were Ray Bradbury's The Martian Chronicles, in which human explorers accidentally destroy a highly advanced Martian civilization, Edgar Rice Burroughs' Barsoom series and a number of Robert A. Heinlein stories prior to the mid-sixties. Author Jonathan Swift made reference to the moons of Mars, approximately 150 years before their actual discovery by Asaph Hall, detailing reasonably accurate descriptions of their orbits, in the 19th chapter of his novel Gulliver's Travels. In Gustav Holst's The Planets Suite, Mars is depicted as the "Bringer of War". ^ Mars Fact Sheet. NASA. Retrieved on 2007-08-02. ^ Mars: Facts & Figures. NASA. Retrieved on 2007-03-06. ^ NASA Images Suggest Water Still Flows in Brief Spurts on Mars. NASA/JPL (December 6, 2006). Retrieved on 2007-01-04. ^ Webster, G.; Beasley, D. (September 20, 2005). Orbiter's Long Life Helps Scientists Track Changes on Mars. NASA. Retrieved on 2007-02-26. ^ a b c David R. Williams (September 1, 2004). Mars Fact Sheet. National Space Science Data Center. NASA. Retrieved on 2006-06-24. ^ Peplow, Mark. How Mars got its rust. Retrieved on 2007-03-10. ^ NASA Mars Page. Volcanology of Mars. Retrieved on 2006-06-13. ^ Goddard Space Flight Center. New Map Provides More Evidence Mars Once Like Earth. Retrieved on 2006-03-17. ^ Mars' South Pole Ice Deep and Wide. NASA (March 15, 2007). Retrieved on 2007-03-16. ^ Malin, Michael C. (June 30, 2000). "Evidence for Recent Groundwater Seepage and Surface Runoff on Mars". Science 288: 2330–2335. ^ NASA Images Suggest Water Still Flows in Brief Spurts on Mars. NASA (December 6, 2006). Retrieved on 2006-12-06. ^ Water flowed recently on Mars. BBC (December 6, 2006). Retrieved on 2006-12-06. ^ "Water May Still Flow on Mars, NASA Photo Suggests", NASA, December 6, 2006. Retrieved on 2006-04-30. ^ NASA (March 3, 2004). Mineral in Mars 'Berries' Adds to Water Story. Press release. Retrieved on 2006-06-13. ^ Sheehan, William. Areographers. The Planet Mars: A History of Observation and Discovery. Retrieved on 2006-06-13. ^ Viking and the Resources of Mars (PDF). Humans to Mars: Fifty Years of Mission Planning, 1950–2000. Retrieved on 2007-03-10. ^ Topography. Think Quest. Retrieved on 2007-03-13. ^ Frommert, H.; Kronberg, C.. Christiaan Huygens. Retrieved on 2007-03-10. ^ Wright, Shawn (April 4, 2003). Infrared Analyses of Small Impact Craters on Earth and Mars. University of Pittsburgh. Retrieved on 2007-02-26. ^ Mars Global Geography. Windows to the Universe. Retrieved on 2006-06-13. ^ Wetherill, G. W. (1999). "Problems Associated with Estimating the Relative Impact Rates on Mars and the Moon". Earth, Moon, and Planets 9: 227. Retrieved on 2007-02-26. ^ Lucchitta, B. K.; Rosanova, C. E. (August 26, 2003). Valles Marineris; The Grand Canyon of Mars. USGS. Retrieved on 2007-03-11. ^ G. E. Cushing, T. N. Titus, J. J. Wynne, P. R. Christensen. (2007). Themis Observes Possible Cave Skylights on Mars (PDF). Lunar and Planetary Science XXXVIII. Retrieved on 2007-08-02. ^ 'Cave entrances' spotted on Mars. NAU. Retrieved on 2007-05-28. ^ Researchers find possible caves on Mars. Paul Rincon of BBC News. Retrieved on 2007-05-28. ^ Philips, Tony (2001). The Solar Wind at Mars. Science@NASA. Retrieved on 2006-10-08. ^ R. Lundin, S. Barabash, H. Andersson, M. Holmström, A. Grigoriev, M. Yamauchi, J.-A. Sauvaud, A. Fedorov, E. Budnik, J.-J. Thocaven,2 D. Winningham, R. Frahm, J. Scherrer, J. Sharber, K. Asamura, H. Hayakawa, A. Coates, D. R. Linder, C. Curtis, K. C. Hsieh, B. R. Sandel, M. Grande, M. Carter, D. H. Reading, H. Koskinen, E. Kallio, P. Riihela, W. Schmidt, T. Säles, J. Kozyra, N. Krupp, J. Woch, J. Luhmann, S. McKenna-Lawler, R. Cerulli-Irelli, S. Orsini, M. Maggi, A. Mura, A. Milillo, E. Roelof, D. Williams, S. Livi, P. Brandt, P. Wurz, P. Bochsler (2004). "Solar Wind-Induced Atmospheric Erosion at Mars: First Results from ASPERA-3 on Mars Express". Science 305: 1933–1936. DOI:10.1126/science.1101860. Retrieved on 2007-02-26. ^ Lemmon et al. (2004). "Atmospheric Imaging Results from Mars Rovers". Science 306: 1753–1756. DOI:10.1126/science.1104474. ^ V. Formisano, S. Atreya, T. Encrenaz, N. Ignatiev, M. Giuranna (2004). "Detection of Methane in the Atmosphere of Mars". Science 306: 1758–1761. DOI:10.1126/science.1101732. ^ "Mars Express confirms methane in the Martian atmosphere", ESA, March 30, 2004. Retrieved on 2006-03-17. ^ Martin Baucom (2006). "Life on Mars?". American Scientist 94 (2). Retrieved on 2007-02-26. ^ a b C. Oze, M. Sharma (2005). "Have olivine, will gas: Serpentinization and the abiogenic production of methane on Mars". Geophys. Res. Lett. 32: L10203. DOI:10.1029/2005GL022691. Retrieved on 2006-04-18. ^ J. T. Mellon, W. C. Feldman, T. H. Prettyman (2003). "The presence and stability of ground ice in the southern hemisphere of Mars". Icarus 169 (2): 324–340. DOI:10.1016/j.icarus.2003.10.022. Retrieved on 2007-02-26. ^ "Mars Rovers Spot Water-Clue Mineral, Frost, Clouds", NASA, Dec. 13, 2004. Retrieved on 2006-03-17. ^ Mars' desert surface.... MGCM Press release. NASA. Retrieved on 2007-02-25. ^ Goodman, Jason C (September 22, 1997). The Past, Present, and Possible Future of Martian Climate. MIT. Retrieved on 2007-02-26. ^ Philips, Tony (July 16, 2001). Planet Gobbling Dust Storms. Science @ NASA. Retrieved on 2006-06-07. ^ Darling, David. Mars, polar caps, ENCYCLOPEDIA OF ASTROBIOLOGY, ASTRONOMY, AND SPACEFLIGHT. Retrieved on 2007-02-26. ^ MIRA's Field Trips to the Stars Internet Education Program. Mira.org. Retrieved on 2007-02-26. ^ Carr, Michael H. (2003). "Oceans on Mars: An assessment of the observational evidence and possible fate". Journal of Geophysical Research 108 (5042): 24. DOI:10.1029/2002JE001963. Retrieved on 2007-02-26. ^ Phillips, Dr. Tony. Mars is Melting, Science at NASA. Retrieved on 2007-02-26. ^ J. J. Plaut, G. Picardi, A. Safaeinili, A. B. Ivanov, S. M. Milkovich, A. Cicchetti, W. Kofman, J. Mouginot, W. M. Farrell, R. J. Phillips, S. M. Clifford, A. Frigeri, R. Orosei, C. Federico, I. P. Williams, D. A. Gurnett, E. Nielsen, T. Hagfors, E. Heggy, E. R. Stofan, D. Plettemeier, T. R. Watters, C. J. Leuschen, P. Edenhofer (2007). "Subsurface Radar Sounding of the South Polar Layered Deposits of Mars". Science 315. DOI:10.1126/science.1139672. Retrieved on 2007-03-17. ^ Pelletier J. D. (2004). "How do spiral troughs form on Mars?". Geology 32: 365–367. Retrieved on 2007-02-27. ^ MarsToday.Com. Mars Polar Cap Mysery Solved. Retrieved on 2007-01-23. ^ Mars' Orbital eccentricty over time. Solex. Universita' degli Studi di Napoli Federico II (2003). Retrieved on 2007-08-02. ^ Close Inspection for Phobos. ESA website. Retrieved on 2006-06-13. ^ ARES ATTENDANTS: DEIMOS & PHOBOS. Greek Mythology. Retrieved on 2006-06-13. ^ a b Arnett, Bill (November 20, 2004). Phobos. nineplanets. Retrieved on 2006-06-13. ^ Ellis, Scott. Geological History: Moons of Mars. CalSpace. Retrieved on 2007-08-02. ^ Hannsson, Anders (1997). Mars and the Development of Life.. Wiley. ISBN 0-471-96606-1. 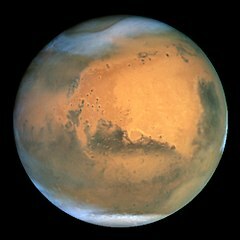 ^ "New Analysis of Viking Mission Results Indicates Presence of Life on Mars", Physorg.com, January 7, 2007. Retrieved on 2007-03-02. ^ Vladimir A. Krasnopolsky, Jean-Pierre Maillard, Tobias C. Owen (2004). "Detection of methane in the Martian atmosphere: evidence for life?". [[Icarus (journal)|]] 172: 537–547. DOI:10.1016/j.icarus.2004.07.004. Retrieved on 2007-02-27. ^ "Formaldehyde claim inflames Martian debate", Nature, February 25, 2005. Retrieved on 2006-03-19. ^ Dinerman, Taylor (September 27, 2004). Is the Great Galactic Ghoul losing his appetite?. The space review. Retrieved on 2007-03-27. ^ Other Mars Missions. Journey through the galaxy. Retrieved on 2006-06-13. ^ Mars Global Surveyor. CNN- Destination Mars. Retrieved on 2006-06-13. ^ Britt, Robert (March 14, 2003). Odyssey Spacecraft Generates New Mars Mysteries. Space.com. Retrieved on 2006-06-13. ^ Wardell, Jane (January 26, 2004). Europe's Beagle 2 Mars Probe Stays Ominously Silent. Space.com. Retrieved on 2006-06-13. ^ a b Bertaux et al., Jean-Loup (June 9, 2005). Discovery of an aurora on Mars. Nature Magazine. Retrieved on 2006-06-13. ^ Mars Exploration Rovers- Science. NASA MER website. Retrieved on 2006-06-13. ^ Phoenix: The Search for Water. NASA website. Retrieved on 2007-03-03. ^ Mars Science Laboratory. NASA's MSL website. Retrieved on 2007-03-03. ^ ExoMars. ESA website. Retrieved on 2007-03-03. ^ Rincon, Paul (November 10, 2006). European Mars launch pushed back. Retrieved on 2006-10-10. ^ Britt, Robert. When do we get to Mars?. Space.com FAQ: Bush's New Space Vision. Retrieved on 2006-06-13. ^ Liftoff for Aurora: Europe’s first steps to Mars, the Moon and beyond (October 11, 2002). Retrieved on 2007-03-03. ^ Deimos. Planetary Societies's Explore the Cosmos. Retrieved on 2006-06-13. ^ Mars Observing FAQ. Shallow Sky. Retrieved on 2006-06-15. ^ Rao, Joe (August 22, 2003). NightSky Friday - Mars and Earth: The Top 10 Close Passes Since 3000 B.C.. Space.com. Retrieved on 2006-06-13. ^ Beish, Jefrey. The 2007 Aphelic Apparition of Mars. Retrieved on 2007-02-28. ^ Breyer, Stephen (March 1979). "Mutual Occultation of Planets". Sky and Telescope 57 #3: 220. ^ Snyder, Dave (May 2001). An Observational History of Mars. Retrieved on 2007-02-26. ^ Zahnle K. (2001). "Decline and fall of the Martian empire". Nature (journal) 412: 209–213. DOI:10.1038/35084148. ^ Salisbury F. B. (1962). "Martian Biology". Science (journal) 136 (3510): 17–26. Retrieved on 2007-02-26. ^ Google Mars. Retrieved on 2007-02-26. ^ Sheeham, William (February 2, 1997). Motions of Mars. The Planet Mars: A History of Observation and Discovery. Retrieved on 2006-06-13. ^ Planet Symbols. NASA solar system exploration. Retrieved on 2006-06-13. ^ Percivel Lowell's Canals. Retrieved on 2007-03-01. ^ Fergus, Charles (May 2004). "Mars Fever". Research/Penn State 24 (2). Retrieved on 2007-08-02. ^ Tesla, Nikola (February 19, 1901). Talking with the Planets. Collier's Weekly. Retrieved on 2007-05-04. ^ Cheney, Margaret (1981). Tesla, man out of time. Englewood Cliffs, New Jersey: Prentice-Hall, 162. ISBN 978-0-13-906859-1. OCLC 7672251. ^ "Departure of Lord Kelvin", The New York Times, May 11, 1902, p.29. ^ a b Professor Pickering (January 16, 1901). The Light Flash From Mars (PDF). The New York Times. Archived from the original on 2007-05-20. Retrieved on 2007-05-20. ^ Radio's War of the Worlds Broadcast (1938). Retrieved on 2007-03-01. ^ Swift, Jonathan and the moons of Mars. David Darling. Retrieved on 2007-03-01. ^ Kathy Miles and Charles F Peters II. Unmasking the Face. Retrieved on 2007-03-01. This page was last modified 16:44, 5 August 2007.